Another Sephora Play! has arrived, and it’s a little on the late side this month. The theme is, “Festival of Beauty,” but again, a pretty nebulous theme that doesn’t actually make sense for any of the products in the box. This is box variant #364 and it arrived yesterday, March 21, 2018. I saw the spoilers and wasn’t too pleased with what was going to show up, but again, for $10, I guess I don’t have a lot of room to complain, but! Then I saw the bag. Sephora, you’re better than this. 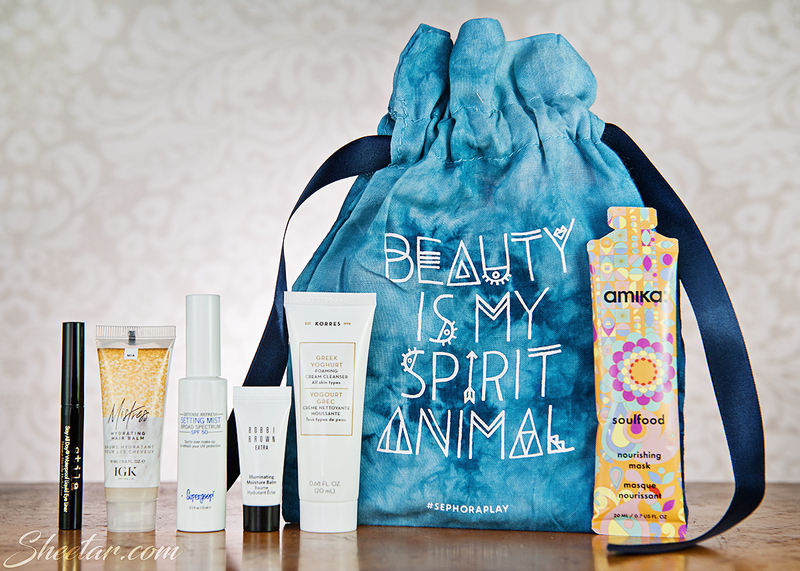 There’s a great article here that goes into the detail on the use of the term, “Spirit Animal,” and it’s really awful that Sephora chose to use it on the bag this month. It’s a shame, because I love the bag fabric, color, and ribbon, but the use of a culturally insensitive term like that really ruins it for me. They could’ve easily said, “Beauty is my life,” or, “Beauty is my passion” instead of using a term that’s garnered some controversy. Anyway, rant aside, on to the contents. Stila Stay All Day Waterproof Liquid Eye Liner – .016 oz / $22 – (Product is .008 oz, value of $11 by volume) I know I have a sample of this that I’m already using, but it must be from a gift-with-purchase or something. I could’ve sworn it came in another Sephora Play! box, but I guess not since I didn’t find it in the blog archives (I missed posting a few months, so maybe it was in one of those?). Anyway! Waterproof black eyeliner from a cruelty free company? Yeah I can use that! IGK Mistress Hydrating Hair Balm – 5 oz / $29 – (Product is .5 oz, value of $2.90 by volume) Well, sure, it’s paraben and sulfate free, but unfortunately the third and fourth ingredients are silicones, so it’s a hard pass for me. If you’re using products without parabens and sulfates, then you’re not able to wash out the silicones in this product that build up on your hair, so it’s silly to be all “we’re good for curls!” when you’re not. It’s also incredibly heavily perfumed and smells just awful to me. I’ll stick to my natural hair products, thank you very much! Supergoop Setting Mist – 3.4 oz / $28 – (Product is .5 oz, value of $4.11 by volume) It’s got an SPF 50 rating, but it’s heavily alcohol based which is bad for dry skin, and it has peppermint and spearmint oil, so that pretty much makes it a nope for me (mints tend to irritate my skin, and they just smell awful to me – why would you want a face product to smell like toothpaste?!). This goes traight to the trade/give-away pile. Bobbi Brown Extra Illuminating Moisture Balm – 1 oz / $68 – (Product is .17 oz, value of $11.56 by volume) It’s basically a moisturizer with a very, VERY subtle pearlescence. It’s okay – nothing really amazing, definitely not $68 for an ounce amazing, plus it’s not cruelty free, so this wouldn’t end up in my skincare routine on the regular. Korres Greek Yoghurt Foaming Cream Cleanser – 5.07 oz / $26 – (Product is .68 oz, value of $3.49 by volume) I haven’t yet tried this, but I love Korres products already. Even though they started selling in mainland China, it’s only via internet sales, so they maintain their cruelty free status. The cleanser smells light and fresh, and I love having these smaller sizes for travel. Amika Soulfood Hair Mask – 2 oz / $12 – (Product is .7 oz, value of $4.20 by volume) This is another product I haven’t tried yet since it’s going to be a single use foil packet tube. Unfortunately, a quick glance at the ingredients means I won’t be trying this either since it contains silicones that don’t wash out without a shampoo containing SLS/ALS which I don’t use, so they just build up over time, and that’s no good. It also contains Isopropyl alcohol (ie. Rubbing Alcohol) which is a heavy NO for dry and curly hair (SERIOUSLY?!). I’d never EVER put rubbing alcohol on my hair and expect it to be nourished, so I can’t even believe it shows up in the ingredients here. Hard pass. The total value of this box comes to $37.26 which is pretty great for a cost of $10.60 per month including tax and shipping. Unfortunately this box is mostly a miss for me since they included products that they thought were suited to my curly hair profile, but aren’t actually suitable for curly hair at all. Super disappointing. I will keep and use the eye liner, cleanser, and moisturizer which still make up for the cost of the box, but I’m bummed about the two hair products being absolute misses as well as the controversy over the bag. Honestly, I’d be happy to go without the silly bag if we can get a full-sized product each month. We’ll see what next month brings!